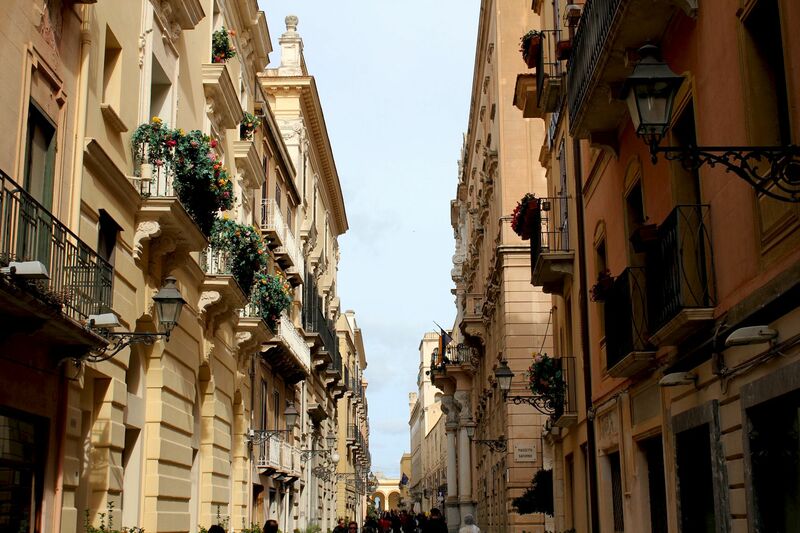 Trapani founded by elusive Elymians, then over millennia ruled by Phoenicians, Romans, Arabs and Europeans now offers the best brought by all these civilizations …. Trapani (similarly as the nearby Erice) was founded by Elymians - mysterious population that most likely came from an ancient Troy. Historians tend to agree that after the devastating 11th century BC war with Greeks, Trojans went out into the sea in search for a new “homeland”, finding it on a scarcely populated Sicilian Island. The first documented history of Trapani comes with the new wave of colonization in 8th century BC - this time by Phoenicians. During the next few centuries the city benefited from its location as a commercial hub exchanging goods between Carthage (Africa), Sicily (including eastern part of the island controlled by Greeks) and growing Roman Imperium. Commercial exchanges with Greeks led to Hellenization of Trapani – as the result the city was known by its Greek name as Drepanon (In Greek means “sickle” what refers to the shape of Trapani’s peninsula). After the fall of Roman Imperium and few centuries of “chaos” Trapani came under the control of Arabs. They brought new life to the city modernizing its civil and defensive “infrastructure”. They also contributed to Trapani’s economic revival by growing production of salt, fishing, “harvesting” coral, modernizing agriculture and re-establishing commercial trading. 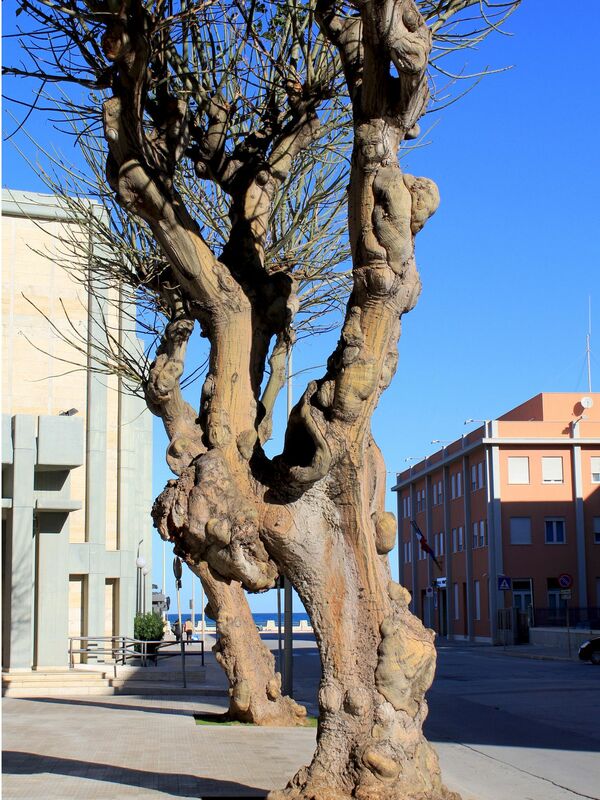 But the biggest contribution of Arabs to the city (or at least lasting long) turned out to be its new name: Itrabinis later evolving to Trapanesch and finally to its current name Trapani. King Roger I conquered Trapani in 1077 and for the next several centuries the city was flourishing under the control of successive European crowns (Norman, Aragon, Bourbon, ….). Its area largely extended beyond the original protective walls reaching the foothills of nearby Monte San Giuliano. Much of today’s old city including churches, palaces and government buildings dates to late medieval and early modern times covering the span from 14th to 20th century. 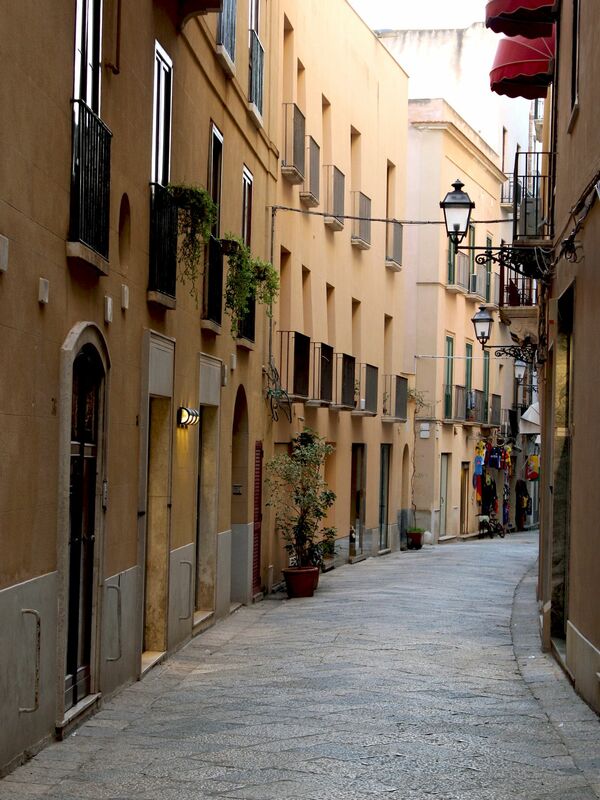 Architecturally, the old town skillfully combines elements of several styles including Norman Gothic and Italian Renaissance with Moorish-Catalan accents and Sicilian flavor of Baroque. Then came the WW2 and with it - massive allied bombardments bringing to ruins a large part of the old city, especially quarters next to the Porto San Pietro. Fortunately reconstruction efforts of 1950s and 1960s restored major part of the old city back to its past glory. Well, too good to be true - the 1968 earthquake known as Terremoto del Belice with an epicenter in the nearby Valley of Belice brought the strong (5.5 degrees Richter as the matter of fact) message from the Mother Nature proving that the local “tranquility” is quite fragile. The old town is quite small and easy to explore on foot so frankly, this is the best option for visitors. On top of “not-to-miss” tourists attractions like some churches, museums and palaces (see below), the old town is simply too elegant to pass the pleasure of wandering along the streets. Pedestrian Corso Vittorio Emanuele lined-up with beautiful baroque façade of palaces and churches is undoubtedly the most representative street in the old town. It starts at magnificent Palazza Senatorio (Cavaretta) and leads to Torre di Ligny at the westernmost tip of the peninsula. Along – a display of historical monuments like Church of Jesuits (Chiesa del Collegio dei Gesuiti) , Cathedral of San Lorenzo, Palazzo del Vescovado (Bishop’s Palace), Palazzo Ferro, Palazzo Marini….. (Two blocks to the south from the cathedral there is one more must to see – the Church of Purgatorio). Via Torre Arsa from the little Piazza di Saturno where stands one of Trapani’s oldest existing churches – Church of St. Augustine and next to it Fountain of Saturn leads along the Palazzo Senatorio and Clock Tower towards the loggia known as the Fish Market (Mercato del Pesce). Via Giuseppe Garibaldi starts from Via Torre Arsa and leads to the Piazza Vittorio Veneto with monumental Municipal Building, equally impressive Post Office and Palazzo del Governo. Along facades of Church of San Giuseppe (former Chiesa del Carminello), elegant Palazzo del Barone Giardino, Palazzo Milo (Baroni della Salina), CHurhc of Santa Naria dell’Itria, Palazzo Riccio di Morana, Palazzo Fardella Fontana ….. 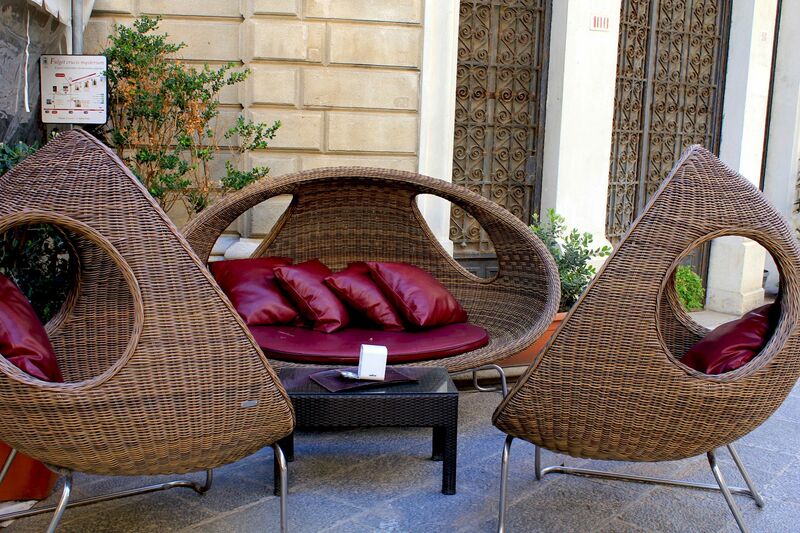 The best part of this itinerary is left for the end - Villa Margherita – a large fenced garden with giant trees…. 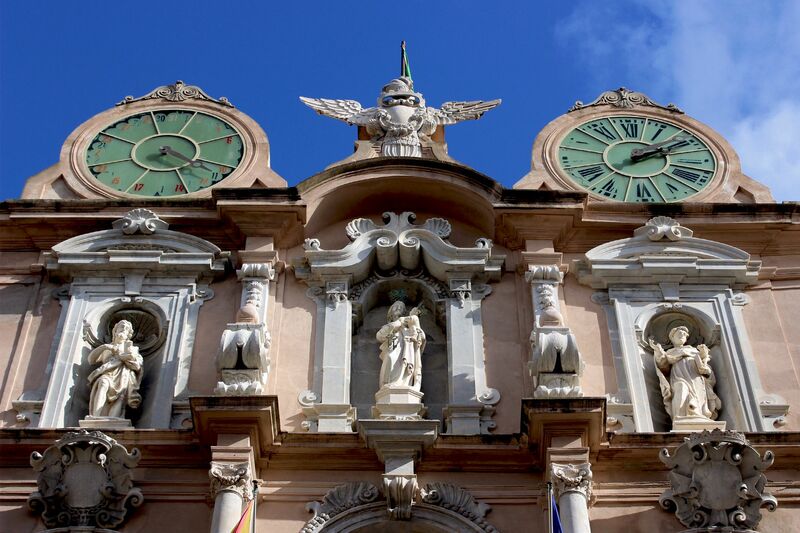 Venturing a bit eastward along Via Conte Agostino Pepoli (clearly outside of the old town) leads to the Basilica of Annunciation and the Pepoli Museum – both on the list to see when in Trapani. 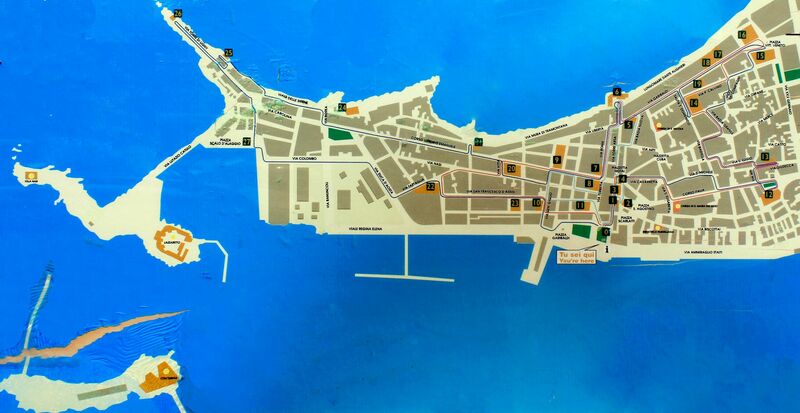 But your visit to Trapani wouldn’t be complete without walking along the sea (especially northern side of the town), without stopping at one of little café-bars, without “getting lost” …. Basilica was built in 1315-1332 in a popular at those times Gothic style. In 1760s the complex was remodeled receiving new Renaissance look; only original Gothic doorway was left untouched. 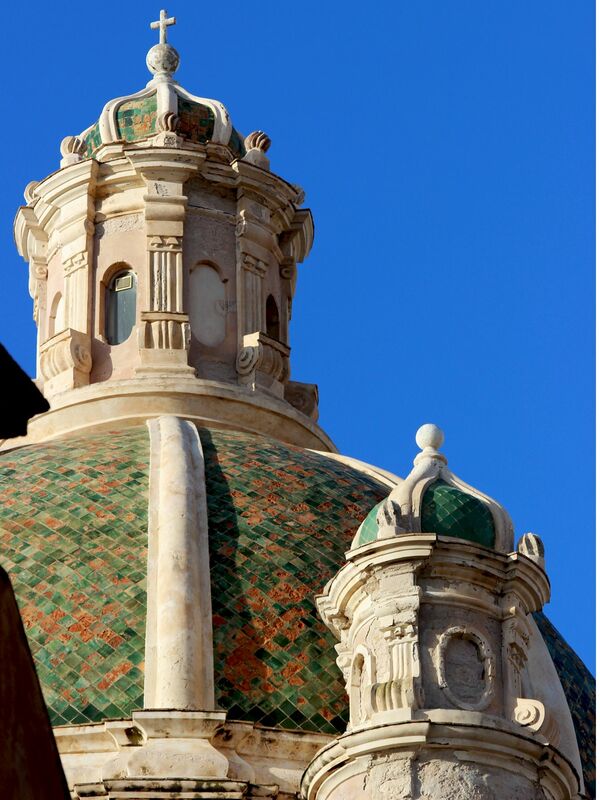 Basilica’s architectural eclecticism was farther “enhanced” with the addition of baroque Bell-Tower. The Sanctuary is home to the precious and fervently venerated Madonna with Child (called also Madonna of Trapani). This 14thcentury statue made from an exceptionally white marble is attributed to the Nino Pisano. 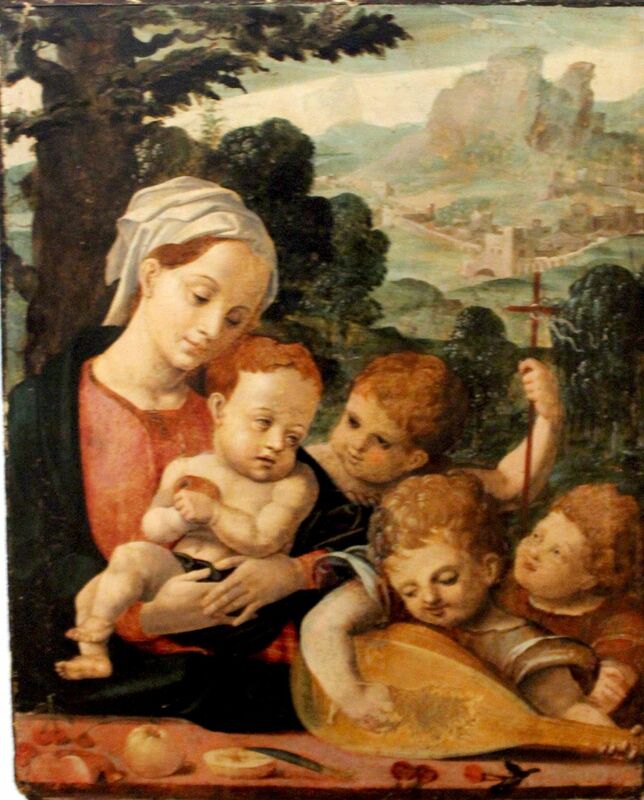 Interestingly, not much is known about the life of Pisano, probably the best existing testimony to his life is the series of sculptures representing Madonna con Bambino (Madonna with Child) that can be find in few other churches in Italy. Trapani’s Madonna with Child stands in a sumptuously decorated chapel under the canopy supported by eight red-marble columns. On both sides are statues of Angels. For quite long time Basilica was the most important church in Trapani (the Church of San Lorenzo became consecrated cathedral only in 1844). So not surprisingly Basilica houses chapels dedicated to fishermen and sailors (15th century Capella dei Pescatori and 16th century Capella dei Marinai). They reflect both – an economic importance and dangers of these two professions throughout millennia long history of Trapani. With their raw, unadorned stone walls chapels are deeply contrasting with the adjacent Capella della Madonna. But the sophistication of the stone-work, “disappearing” frescoes and beautiful although now empty niches that in the past probably housed statues of patrons of fishermen and sailors can light-up imagination…. It’s worth to note that the Chapel of Fisherman is the oldest surviving part of the original gothic church. The whole complex of Basilica including adjacent monastery is located outside of the old town (some 2.5 miles or 4 km from the center) so quite often it is missed by unaware visitors. The museum is housed in the former Carmelite monastery next to the Basilica of Annunciation. It was founded in early 20th century by Count Agostino Pepoli – a visionary scholar who dedicated to the museum his large private collection of art. 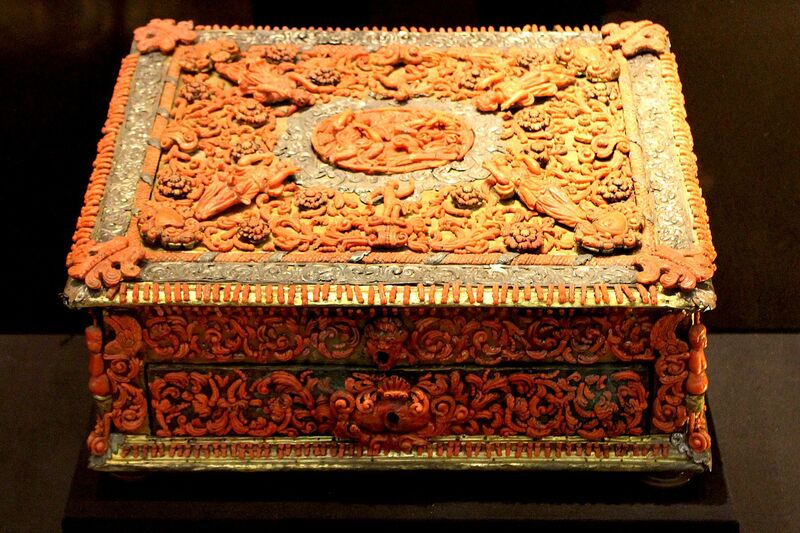 The museum houses countless archeological artifacts from the area of Trapani, but also magnificent collections of art covering the period from 13th to 19th century. Sculptures by Antonello and Vincenzo Gagini, paintings by Titian, Ribera… (to name only most famous masters), decorative art, religious artwork from local churches, old floor mosaics, masterpieces of art in coral, gold and precious stones…. The collection also displays jewelry from the treasury of Madonna of Trapani that once was guarded in the adjacent Basilica of Annunciation. 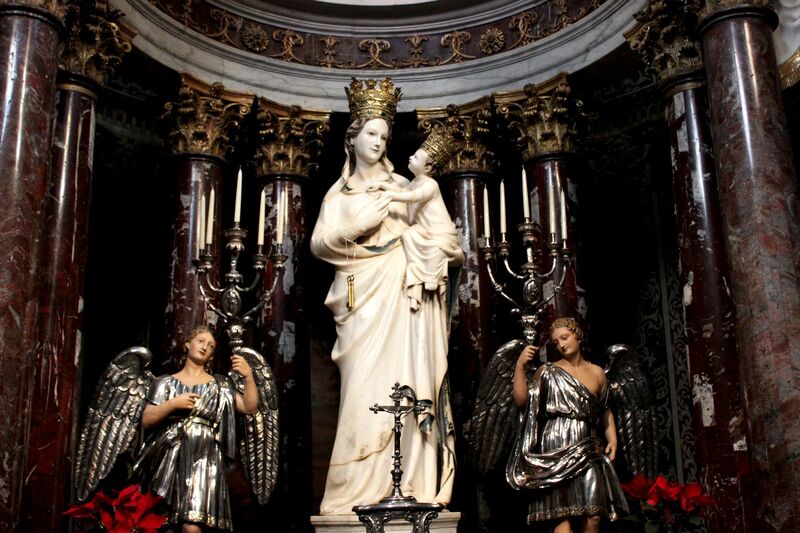 It includes precious donations by royals and nobles to the famous statue of the Virgin Mary. Surprisingly, museums also keep on display an original guillotine with a blood-freezing “head-basket”. It’s not clear to me why, because such “historical” object does not match the “spirit” of the entire Pepoli’s collection. It would rather perfectly fit into the Museum of Torture which anyhow - if existing would not find place on these pages. The Cathedral of San Lorenzo was built in 1421 at the order of king of Aragon, Naples and Sicily – Alfonso V (one of the most brilliant monarch of his time – rightfully known as Magnanimous). 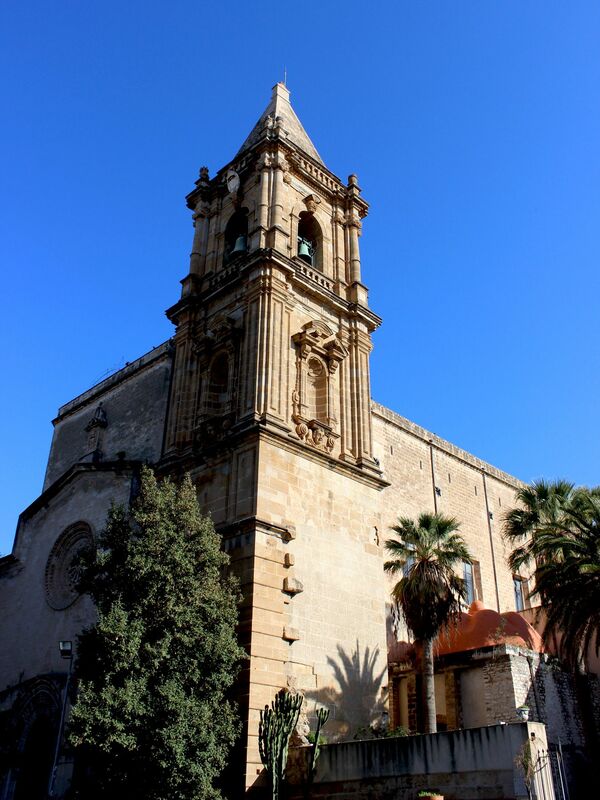 The church was erected in the heart of the Old Trapani on the site of pre-existing chapel dedicated to St. George. Like most historical structures, it underwent several modifications. The most meaningful remodeling works were carried out in 1630s when the old church was completely re-built by an architect Bonaventura Certo. Due to the emergency (old church was almost collapsing) as well as lack of funds, the new structure came short of features expected for the Mother Church. Not surprisingly, some hundred years later in 1740s the next remodeling or rather expansion steps were undertaken under the direction of an architect Giovanni Amico. With the addition of bell-tower, entrance portico, dome, side-chapels and the choir the Church of San Lorenzo considerably changed its shape and architectural lines. Certainly the main façade with a large Baroque portico, attached bell-tower and rich internal stucco decoration and paintings added to the church much sought and deserved magnificence. As the result, in 1844 the Church was consecrated cathedral by Pope Gregory XVI. Cathedral’s large interior is divided into three naves by the rows of columns supporting the main roof and lateral arches. Soft colors mixed with penetrating sunlight fill the space with overwhelming elegance. The feeling of “grace” is enhanced by remarkable ceiling frescoes depicting various Biblical scenes (works of Manno Palermo from the late 18th century) and fine stucco adornments. The main altar holds a large painting depicting God Father (work of Domenico La Bruna). This truly imposing personification of the Almighty Father is very unusual in all “colors” of Christianity…. From the artistic point of view, certainly the most precious canvas in the cathedral is the Crucifixion of Christ (4th Chapel on the right). The painting is attributed to the famous 17th century Flemish artist – Anthony Van Dyck. 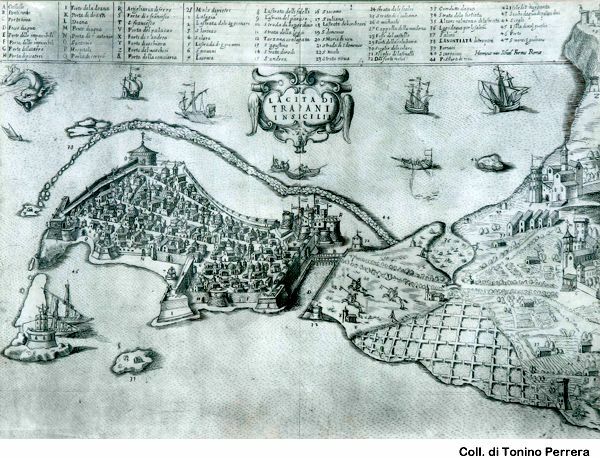 Although Trapani is almost surrounded by water, drinking water was always in short supply. To address the needs of the growing city, the powerful Sicilian family of Chiaramonte financed construction of an aqueduct bringing fresh water from the source at the foothill of nearby Monte San Giuliano (today Mt. Erice). The fountain distributing the water was opened in 1342 at the piazza next to the Church of St. Agostino. 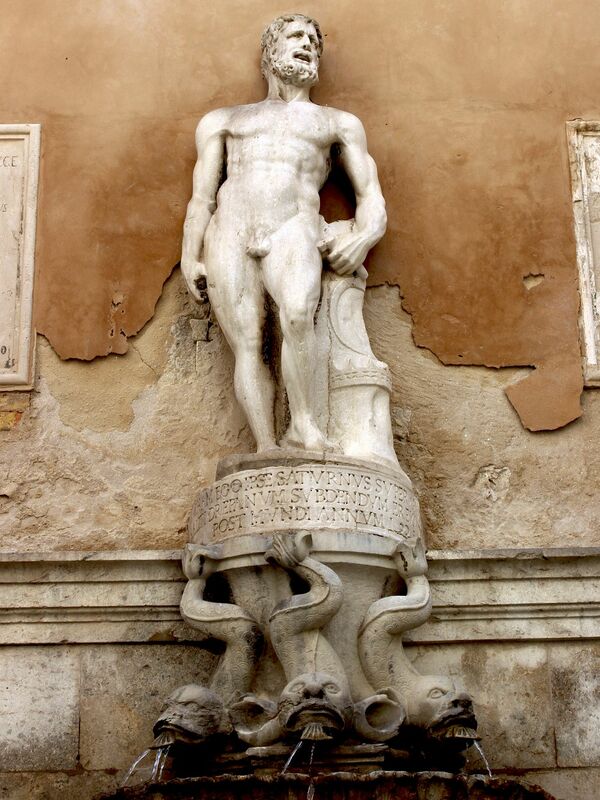 In 1603 the fountain was rebuilt and beautified by the statue of an ancient Roman god – Saturn. It reflected the fact that the mythological Saturn was still considered as one of the patrons of Trapani (despite the fact that since long Sicily was deeply Christian). 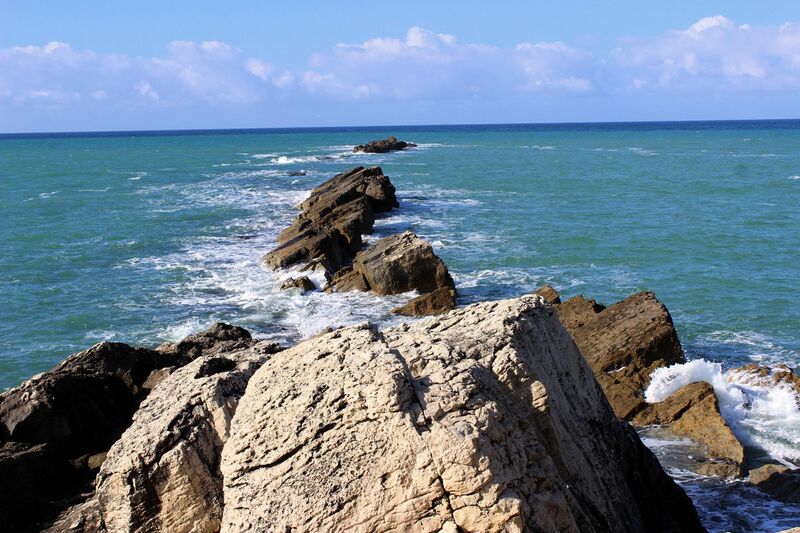 According to the popular myth, Trapani was created when Saturn accidently dropped his sickle into the sea (hence the sickle-like shape of Trapani’s promontory). Others claim that as a god of harvest, Saturn somehow “naturally” represented mostly agricultural society of Sicily. Saturnalia (widely celebrated across the Roman Empire “Festivity of Harvest”) for long stayed alive in collective memory of not only Sicilians. Indeed, in many countries this old pagan festivity expressing our thankfulness to the Mother Nature for the abundance of food is still celebrated in our times. Above the statue there is a bas-relief of royal eagle with the heraldic symbol of Philip III – king of Spain, Naples and Sicily. Today the old aqueduct is gone, but the water is still flowing from the Fountain of Saturn. 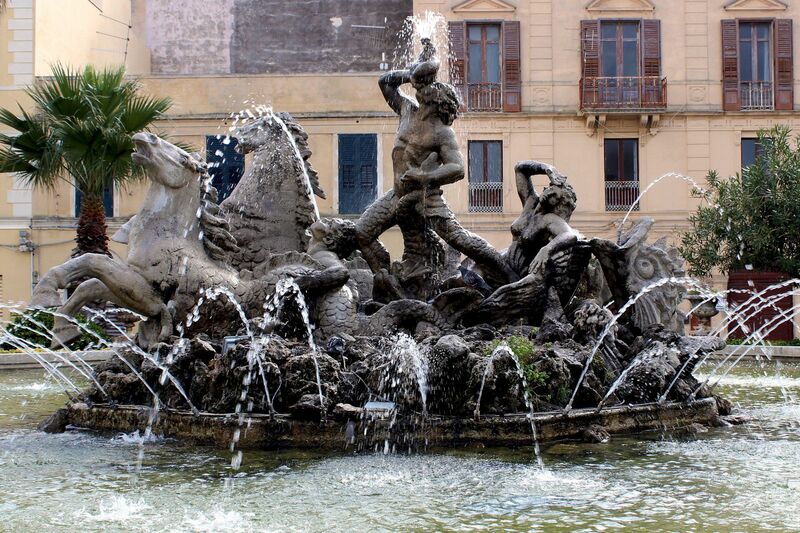 Thanks to its beauty, symbolism and long tradition the Fontana di Saturno is one of the main tourist attractions in Trapani. The original church built in 12th century by Templar Knights was dedicated to St. John the Baptist. In 1313, the king Frederic III of Aragon assigned the church to the order of Augustine Fathers. 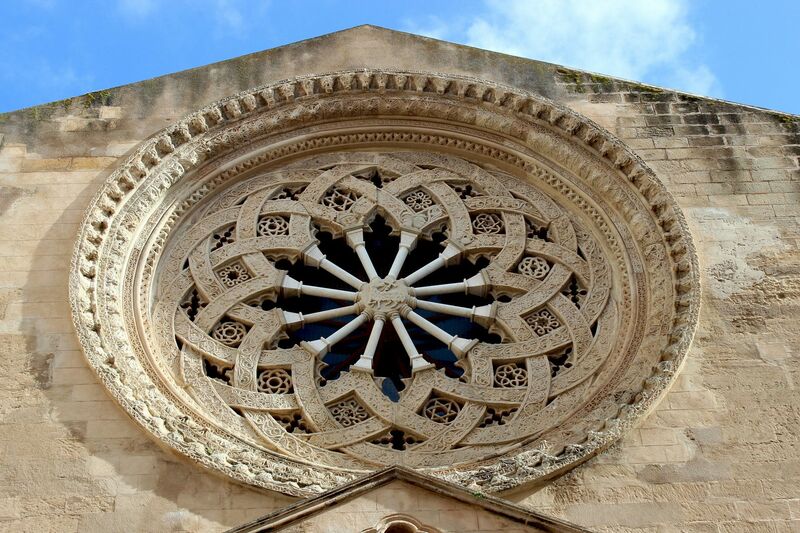 They rebuilt the church in a Sicilian-Gothic style from which we can still admire beautiful frontal rose window and main portal. Interior impresses with several elements of architecture like interlaced arches, columns, polygonal apse, and wooden trusses with paintings displaying grotesque and allegorical scenes derived from medieval life. 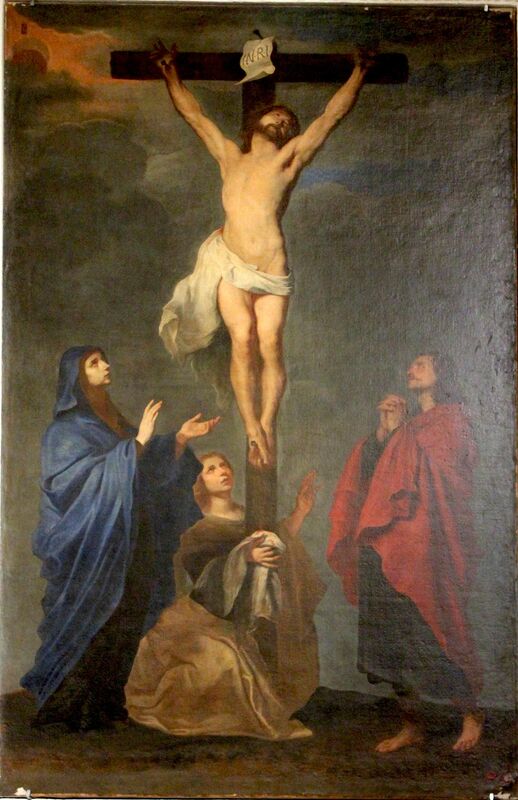 Numerous pieces of religious artwork from the church are now displayed in Trapani’s Pepoli Museum. During WW2 the church was heavily damaged by allied bombardments. Restored and serving as a museum it faces the little piazza called Piazetta San Agostino or Piazetta di Saturno! 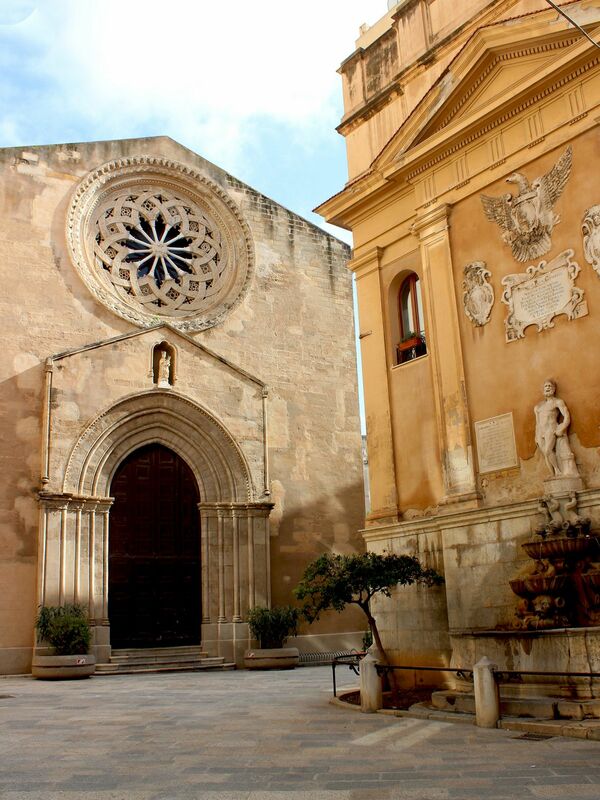 It is worth to mention that the church of San Agostino is one of the oldest surviving medieval structures in Trapani. The Palace Giudecca (also known as Casa Ciambra after the name of its owners) was built in early 16th century. 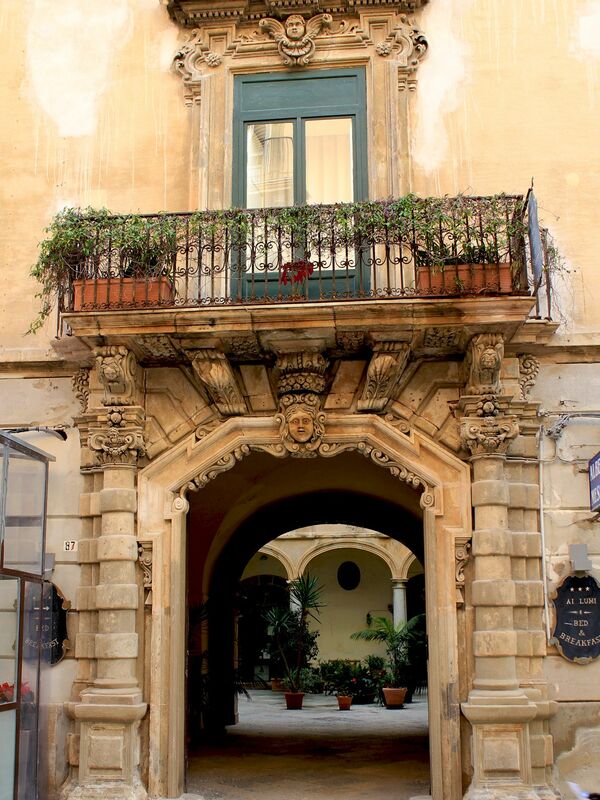 It is considered as the best example of Catalan architecture in Sicily which shortly can be described as a blend of Spanish-Aragon flavor of Gothic with an early Renaissance. The name “Giudecca” comes from its location in the old Jewish Quarters. In the past the word “giudecca” was used to describe a part of the city reserved for Jewish population (kind of Ghetto but without any negative connotation). Interestingly, at the time of palace’s construction Jews were already expulsed from Trapani (as the matter of fact – expulsed from territories ruled by Spanish Crown) following the edict of Ferdinand and Isabella from 1492. So the popular name “Giudecca” was making reference to the fading away past…..
Because the Palazzo Giudecca is privately owned, we can only stop in front of it and marvel at its external facade … (it’s for free). Certainly the unusually “intensive” tower’s decorations as well as beautifully decorated windows catch everybody’s attention. BTW - due to the fact that such ornamentation seems to imitate the work of silverware (in Spanish “plata”), specialists call this style “plateresco” (Platoresque). The Palace Giudecca had certainly time of its glory. 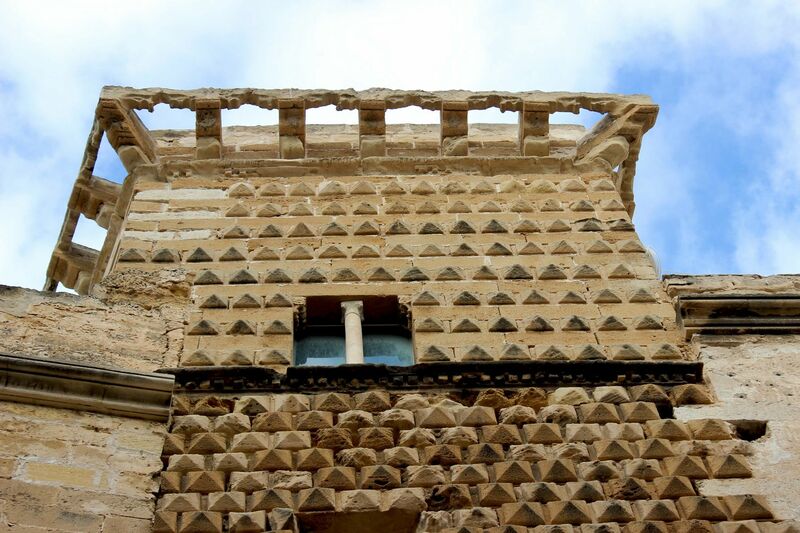 The fact that its lateral tower is depicted on Trapani’s coat of arms (as one of five towers) is a living testimony to the importance of this residence and social position of the owners – family of Ciambra. However the street Via Giudecca (where the palace is standing) in its current state does not match expectations …..
Church of (Souls) of Purgatory was built in 1688 by the architect Pietro Castro. The façade and bell-tower were finished almost 30 years later under the direction of Giovanni Amico. The church has Latin cross layout with main nave and two aisles separated by rows of columns. While the beautiful façade promises an exceptional interior, the truth is quite different – internal part of the church is very modest. What makes the Chiesa Purgatorio very special is something else. The church is famous for housing 20 life-sized groups of statues (called Misteri) depicting scenes from the Passion and Death of Christ. There were commissioned in 17th and 18th centuries and funded by Trapani’s guilds. For example the group depicting Jesus in front of Herod was funded by the Guild of Butchers and is attributed to Francesco and Domenico Nolfo, the group depicting the Ascent of Calvary was commissioned by the Guild of Bakers and Millers, the Burial of Christ was commissioned by the Guild of Coral Craftsmen (in the past a big and lucrative business) ….. 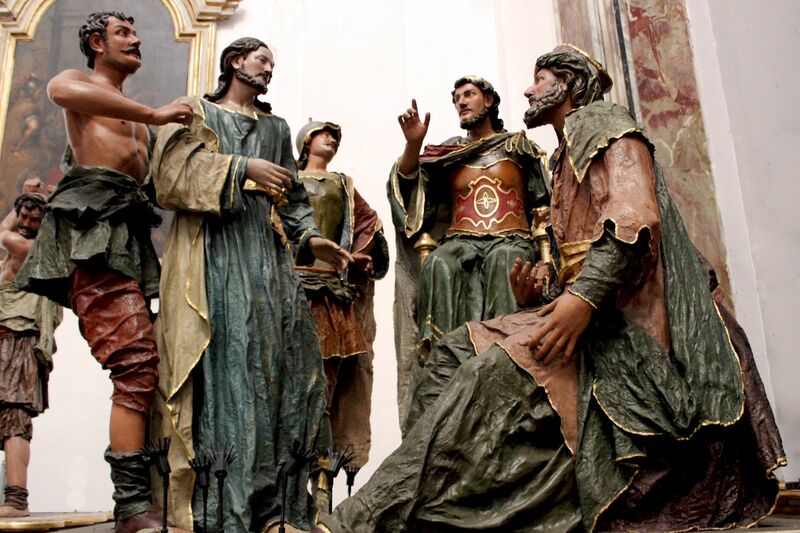 The statues were carved from cypress wood by local craftsmen (mainly in workshops of Giuseppe Milanti, Antonio Nolfo, brothers Francesco and Domenico Nolfo, Giacomo Tartaglia, Baldassare Pisciotta, Mario Ciotta ….). Each Easter during Good Friday’s night procession the Misteri are carried through the narrow streets of Trapani by members of particular professions (due to the weight of effigies it is not an easy task). This deeply religious event has roots in early 17th century reflecting the climate of counter-reformation that swept West-European nations at that time. Torre di Ligny was built in 1669-1671 as part of the re-fortification of Trapani to protect the town from the attacks by pirates. Construction works were ordered by the Spanish Viceroy Claudio Morando, Prince of Ligny (hence the tower’s name). 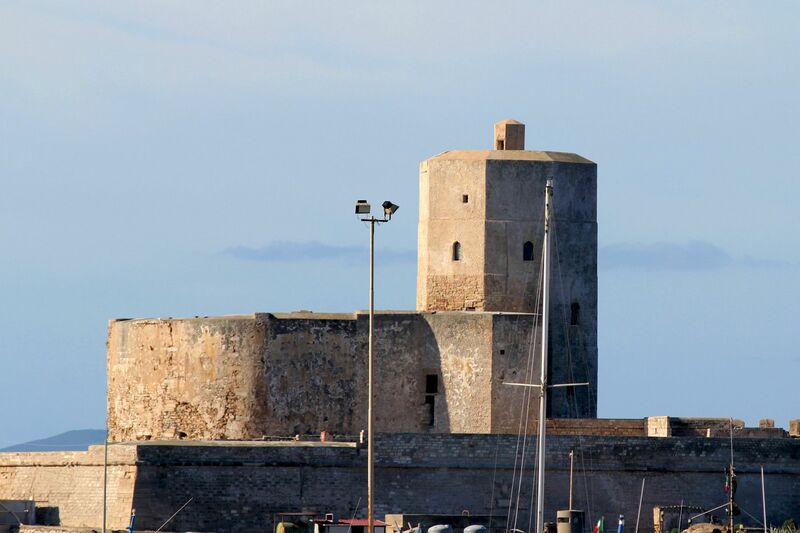 Located strategically at the westernmost tip of Trapani’s peninsula, the tower was used as the lighthouse. It was guiding ships into Trapani’s harbor and helping them to navigate this busy and dangerous part of the Tyrrhenian Sea. Since 1983 the tower houses the Civic Museum including two small sections: Museo di Mare and Museo Preistorico. The first one displays small collection of Phoenician and Roman amphorae recovered from shipwrecks dotting shallow waters of Tyrrhenian Sea. The second one displays some prehistoric artifacts (for example arrowheads….) and remains of equally old or not so ancient, but rather “strange” animals. Probably the best part of the Torre di Ligny is the view on Egadi Islands from the roof. 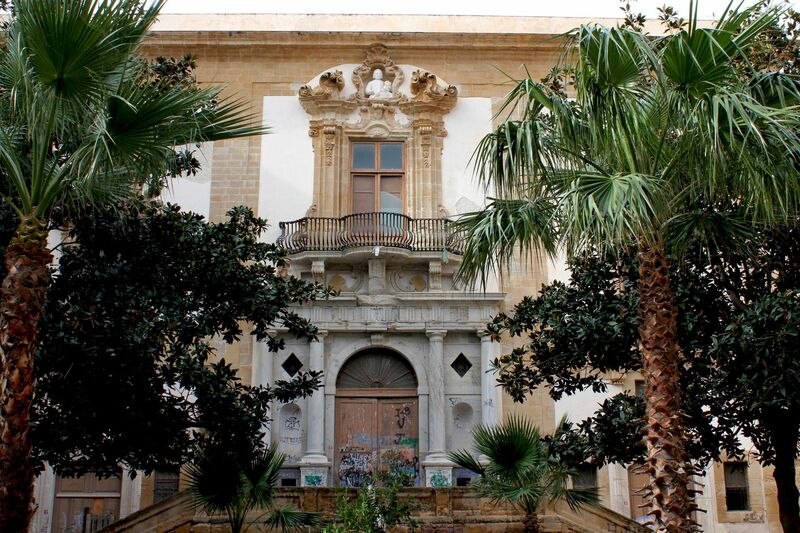 Palace Cavaretta (also known as Palazza Senatorio or Casa del Senato) is one of the landmarks of Trapani and a favorite tourists’ attraction. Its origins go back to the medieval times when the Consulate of mighty Pisa (“Loggia”) stood on this site. The current palace was built in 1670s by Don Giacomo Cavaretta (Knight of Jerusalem). 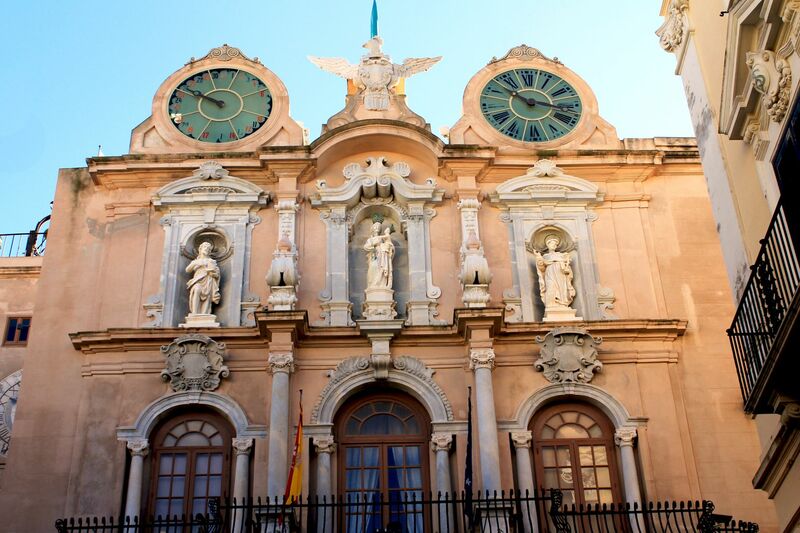 The beautiful baroque façade was designed by architects Simone Pisano and Andrea Palma. 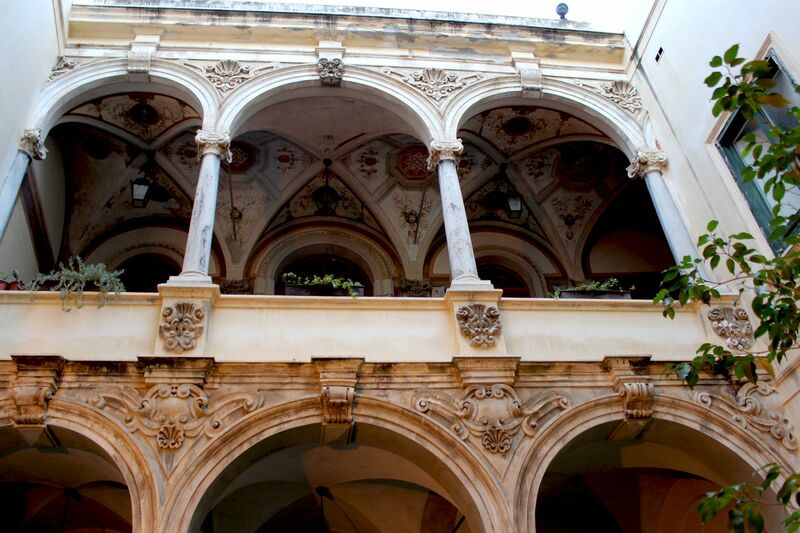 The first order is made by an elaborated design of six columns supporting a long balcony across the façade. The second order columns support arches above the doors. In the niches of the third order are correspondingly the statue of Madonna of Trapani (copy of Madonna with Child by Nino Pisano from the Basilica of Annunciation) and the statues of St. John the Baptist (on the left) and of St. Albert (on the right) – all works of Giuseppe Nolfo. In 1828, façade’s upper order received two large clocks displaying the time and monthly calendar. They gave to the palace so much admired “touch”. But the perfectly harmonious (and truly stunning) view from the Corso Vittorio Emanuele is quite misleading, because the palace largely extends to the right reaching nearby Piazza Saturno. 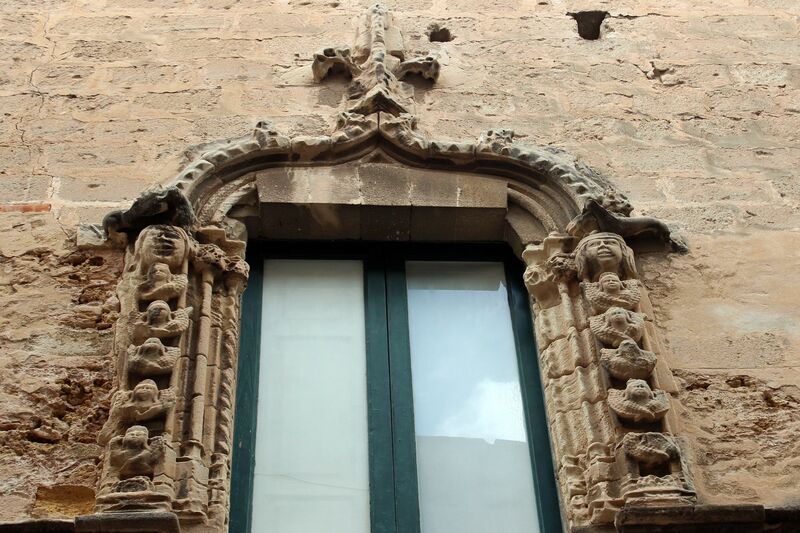 Due to the fact that since long the palace is used as a seat of Trapani’s City Council, it also gained the name Palazzo Senatorio. Next to the Palazzo Cavaretta stands somehow overshadowed by the palace the Gate Tower (Torre Oscura). 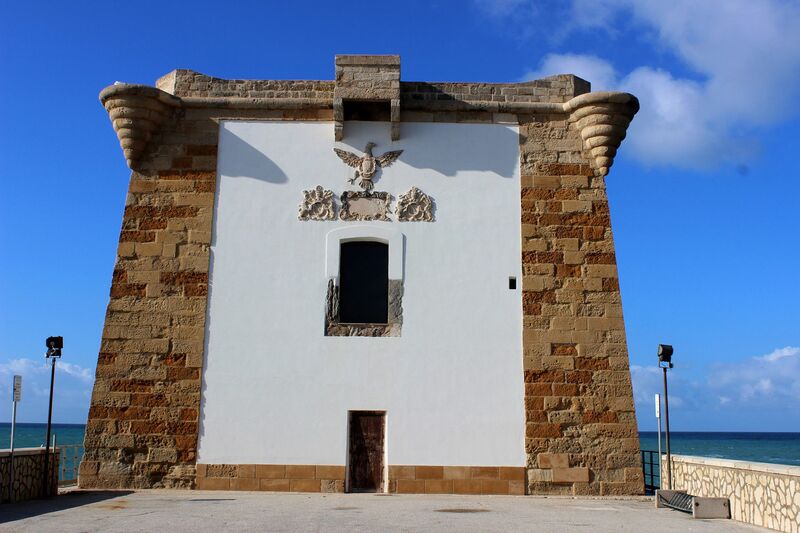 Built in the 15th century, the Porta Oscura is the oldest existing gate in Trapani. It clearly indicates the borders of the old city – at those times separated from the Sicilian mainland by a moat and navigable canal. Today, gate is “integrated” into the structure of the Palazza Cavaretta and most likely it would escape attention if not its famous clocks. The astronomical clock was designed in mid-1500s by a local “watchmaker” Giuseppe Mennella; the lunar clock below was added probably in 1570s by Mastro Admiranti. 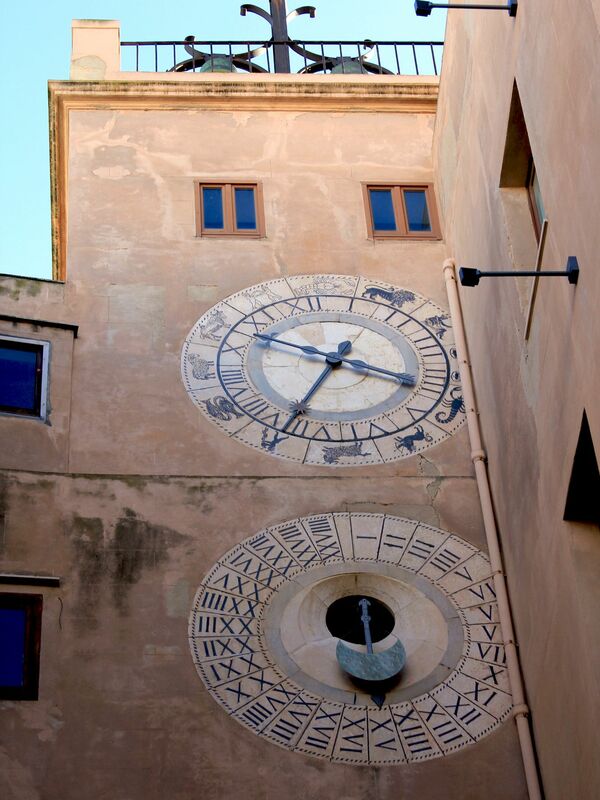 Thanks to the recent renovation they are now some of the oldest still functioning European astronomical clocks. The Sun Clock (upper disc): The arrow ending with the symbol of lily indicates hours of the day (on the 12 hours scale). The arrow ending with the symbol of sun scans the signs of Zodiac indicating also the Cardinal Signs (correspondingly Aries for Spring Equinox, Cancer for Summer Solstice, Libra for Autumn Equinox and Capricorn for Winter Solstice). 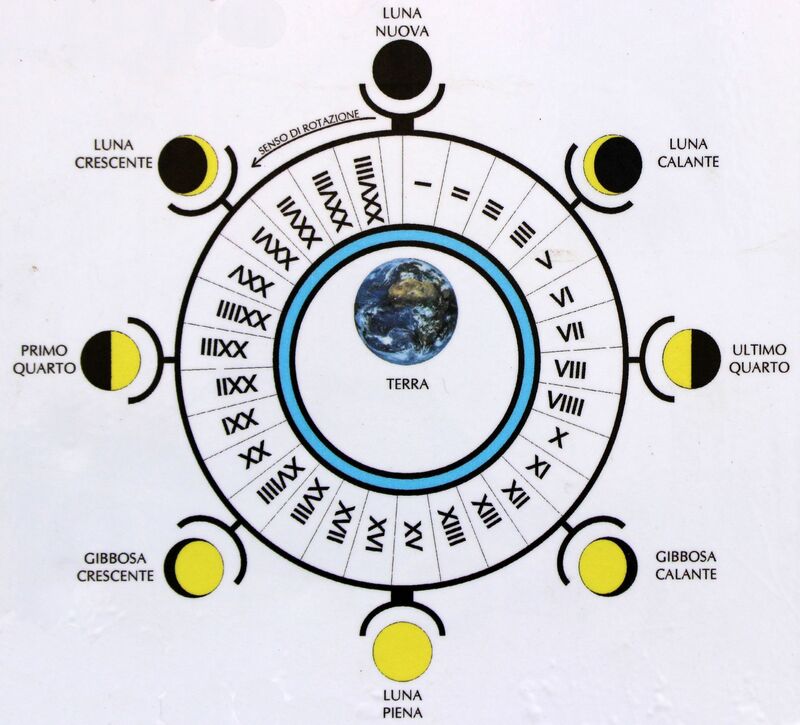 Moon Clock (lower disc): The main arrow indicates the time in the scale of the Lunar month which counts approximately 29 days 12 hours 44 minutes and 3 seconds. It also indicates the four basic phases of the Moon. To make it clear – the lunar month is defined as the period of time needed by the Moon to complete its full cycle (all phases). In more descriptive way the lunar months includes approximately 1 days of the New Moon (invisible Moon) followed by the First Quarter (14 days of Crescent Moon moving towards the Full Moon) and 1 day of the Full Moon followed by the Last Quarter (Waning Moon moving towards the New Moon). The offshore castle has its roots in the Phoenician past. Given the remoteness of time there are more myths than facts regarding its origins. It seems that the first tower was built there in 5th century BC to protect Trapani from assaults by Greeks from Syracuse. In 3rd century BC during the first Punic War the Carthaginian general Hamilcar Barca (father of famous Hannibal) enlarged and reinforced the tower converting the island into the small stronghold guarding the entrance to the harbor. In 241BC, after the battle of Egadi Islands the castle as well as Trapani (known as Drepanon at that time) was captured by Romans…. While certainly during the next millennium the stronghold at the entrance to the port played an important role as a line of defense against enemies and guidance for cargo ships, there is no much documentation covering those times. The Colombaia Castle has its ups and downs. At some time it was serving as a residence for Queen Constanza of Catalonia, but at the end in contrast it was used as a prison for Sicilian patriots uprising against Bourbons and later till 1965 as a jail for common prisoners. Now, rising from the waters the massive structure of the Colombaia is one of the tourists attractions that can be visited by boat. Originally, when built in 1455 the building was designed as a hospital! It underwent several modifications of which the most important were carried out in 17th century and are legacy of Captain Lazarus Lucatelli. At that time the palace got its Catalan (Hispanic Baroque) shape. In mid-18 century the palace was expanded by an architect Giovanni Amico. 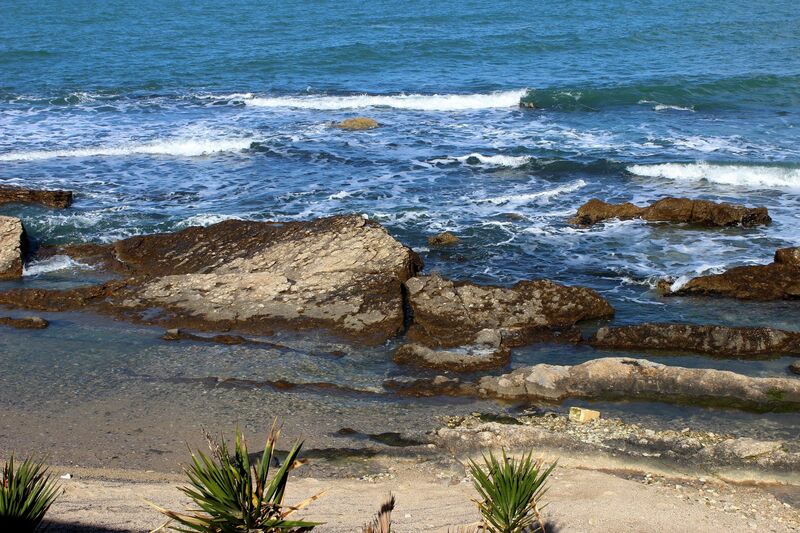 Or, if you would like to take a break from the city, what about sunbathing on the beaches of: --> San Vito lo Capo ?